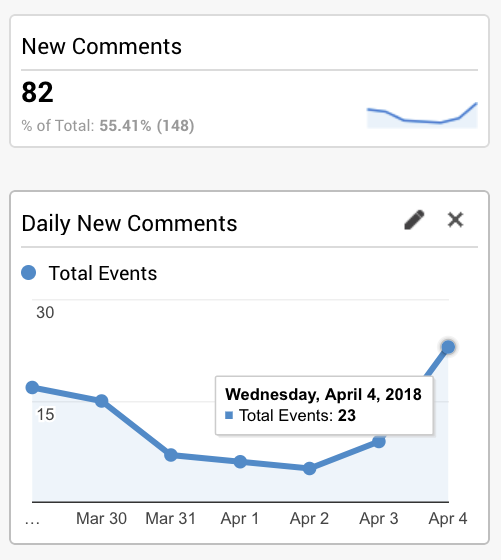 When a new comment is posted on your site, this triggers the onNewComment callback to fire a “New Comment” event that is sent to Google Analytics. Note that this only works for new comment activity and cannot be applied retroactively. If you’d like to track how many times someone reads the comments on your site, you can configure a “read” event to be sent to GA whenever the Disqus iframe comes into view on a page. To find more information on event tracking in Google Analytics, check out their documentation. In Google Analytics, head to Reports > Behavior > Events. From there, create a new widget in your dashboard that tracks total new comments posted over time. Use either a Metric or Timeline-based widget for tracking cumulative total comments or daily trends, respectively. Allow Disqus activity to populate in Google Analytics for a few days. Once you do, you can leverage Google Analytics’ various tools to understand how your audience engagement impacts the other metrics on your site and develop strategies towards increasing engagement. If you don’t use Google Analytics, you can still track total new comments in other analytics services including Chartbeat and Parse.ly using the same method as described above. You will need to replace the Google Analytics script though with your own script for sending events to your analytics service. 💬 Discuss: Which metrics do you currently track? Join us in the discussion below and share the metrics that are vital to your success. We’d love to hear from you so share any questions and feedback you might have. We hope you found this guide useful.